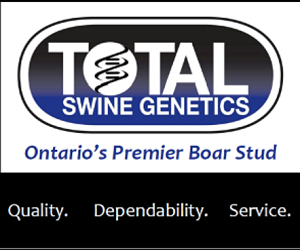 Swine Innovation Porc will be supporting 14 research projects designed to enhance the Competiveness of the Canadian pork sector. Swine Innovation Porc has outlined the details of the major research projects it will be supporting during the five year Swine-Cluster-3 research program. Swine Innovation Porc Chair Stewart Cressman says 18.5 million dollars, including 12.7 million provided under the Canadian Agricultural Partnership and 5.8 million provided by industry will be invested in research designed to maintain the Canadian pork sector’s competiveness. There is 14 projects and some of them have specific subsections to them. By en large nutrition is almost half of the projects, 43 percent. Health is 23 percent. Sometimes it’s like splitting hairs. You could say a project that is dealing with nutrition could also be dealing with health as it impacts the microbiome, which is certainly one of our big areas or research. You could argue, because it’s gut microflora, it’s a nutrition project as well as a health project and so it’s somewhat arbitrary where you categorize it. Nutrition 43 percent, health 23 percent. Welfare, we have four projects. We have a project on pork quality and then one on the environment looking at the environmental footprint analysis of the hog industry, trying to get an up to date picture of it’s environmental footprint.